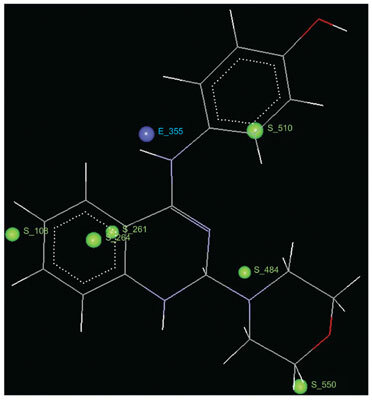 Background: A novel series of 2-(Morpholin-4-yl)-N-phenylquinazolin-4- amine derivatives were synthesized and confirmed with spectral and elemental techniques. Methods: The compounds were tested for analgesic and anti-inflammatory activity by various pain models in rodents whereas the selectivity towards COX-2 receptor is determined by in vitro assay. Results: Screening results of compounds exhibited comparable biological activity with that of standard compound Indomethacin used for study. Compound 5d was found to be significantly potent with respect to its anti-inflammatory and analgesic activity with substantial COX-II selectivity. Conclusion: In silico analysis by molecular docking and 3D-QSAR studies justifies activity profile of compound 5d, suggesting that it may have potential for further evaluation and development as lead molecule for therapy in pain management. 3D-QSAR, analgesic, anti-inflammatory, COX II inhibitor, molecular docking, quinazoline.